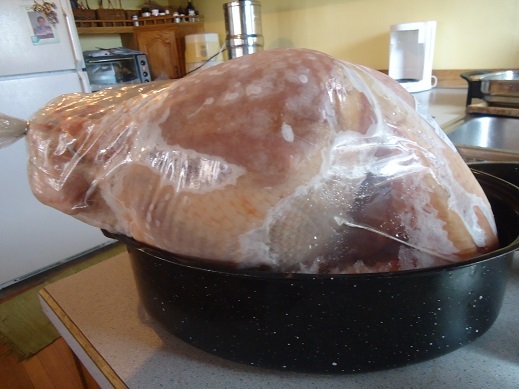 ← It’s Time to do “The Albuquerque Turkey”! Music – “Pomegranate Rag” from By Request by Matthew Davis. Released: 2016. Ah…October in New Mexico. Hundreds of hot air balloons, the rich and heady scent of roasting green chile and…pomegranates! 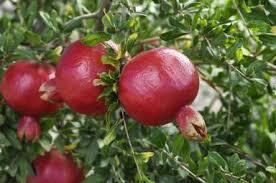 Their Latin name is Punica granatum, and they are thought to have originated in Persia and have been continuously cultivated throughout the Mediterranean. 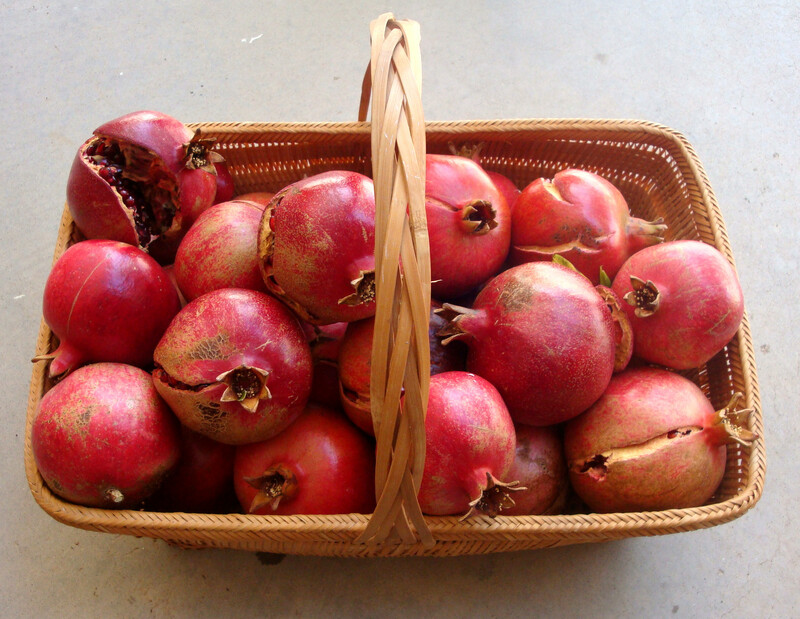 Since the “many-seeded apple” thrives in a climate of low humidity and mild temperatures, pomegranates can be found in backyards throughout the Southwest. At our current residence, we inherited two varieties: “Wonderful” and “Russian“. Depending on the species some pomegranates are borne on trees, but most species in the Southwest are more “shrubby”, including the two in our yard. At our previous residence in the Northeast Heights part of Albuquerque, we also had a pomegranate tree, which after the first year we were there, bore a substantial quantity of fruit. After doing a little research about preparation, I elected to score the tough, leathery skin of the fruits, hold them under water (wearing gloves) and eject the seeds (arils), with some difficulty. It was a laborious, messy job, tedious and with what I thought was very little reward. After harvesting all of the arils, I had to decide what to do with them. I decided to refrigerate some for use in cooking and thought I would make juice out of the rest. But, how to juice? 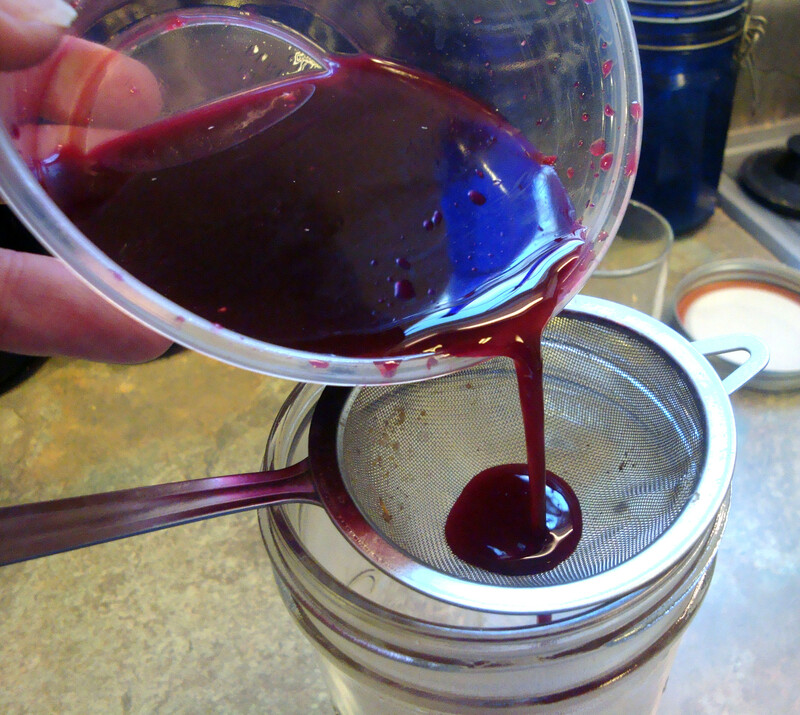 Because of the large size of the seeds, surrounding by that red flesh, my blender quickly clogged and produced very little in the way of juice, also grinding up the seeds in the process, which was not very appetizing and made the juice bitter. Necessity being the mother of invention, I put on my thinking cap and found a way to recycle the empty plastic bags from my favourite boxed wine! After cutting off one corner of the bag (which is actually two bags: a thinner one inside of the heavier liner), I inserted about a half a dozen small pomegranates. 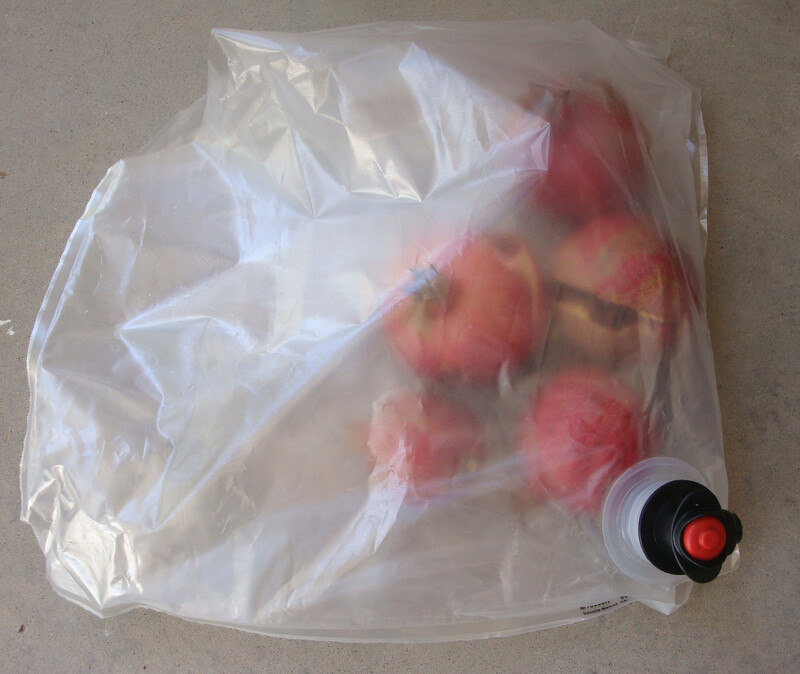 Put about 5 or 6 small pomegranates into the wine bag. Seal it any way you can. At the time, I did not have the benefit of Foodsaver appliance, which I have now, so I used a substantial amount of duct tape to seal the opening. Then, being ever resourceful, and with the assistance of my spouse, I carefully placed the bag under the rear tire of my car and gently rolled it back. Presto! 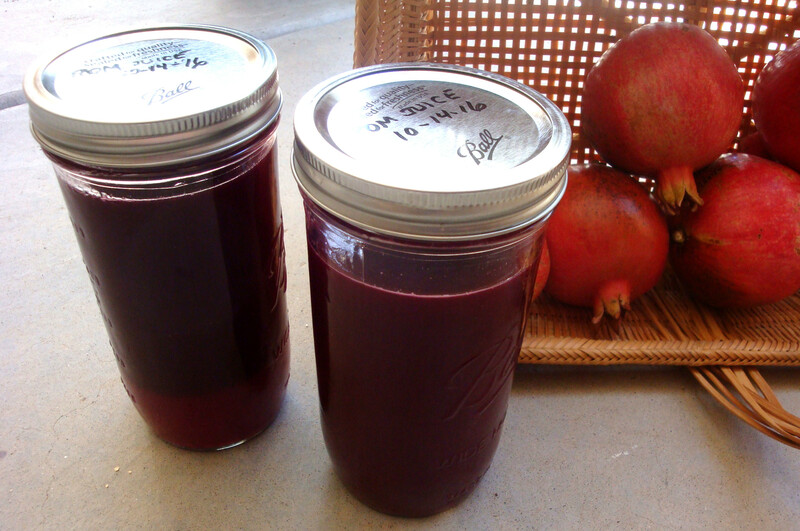 Pomegranate juice! Although there was a small amount of leakage, I did manage to salvage most of it. The bag, however, was a little the worse for wear and couldn’t be reused. 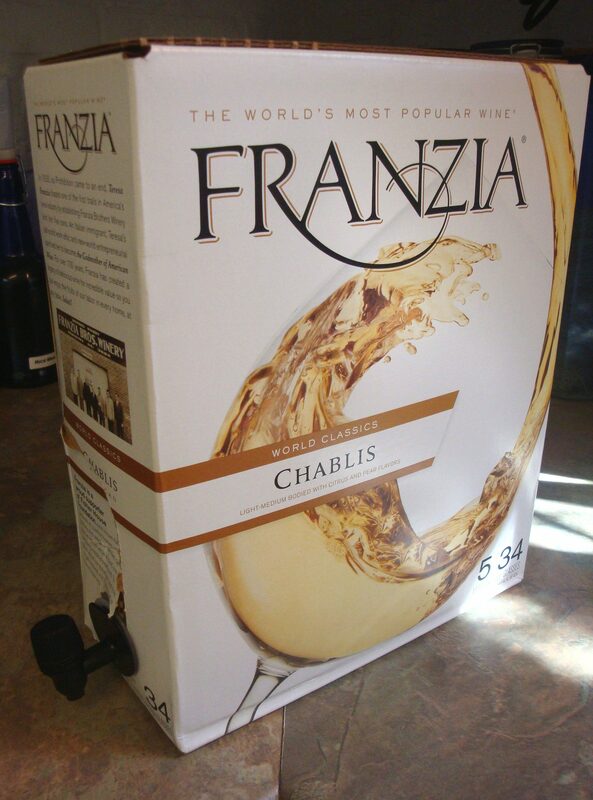 This year, I again saved the wine bags from the boxed wine, but had a slightly different approach. 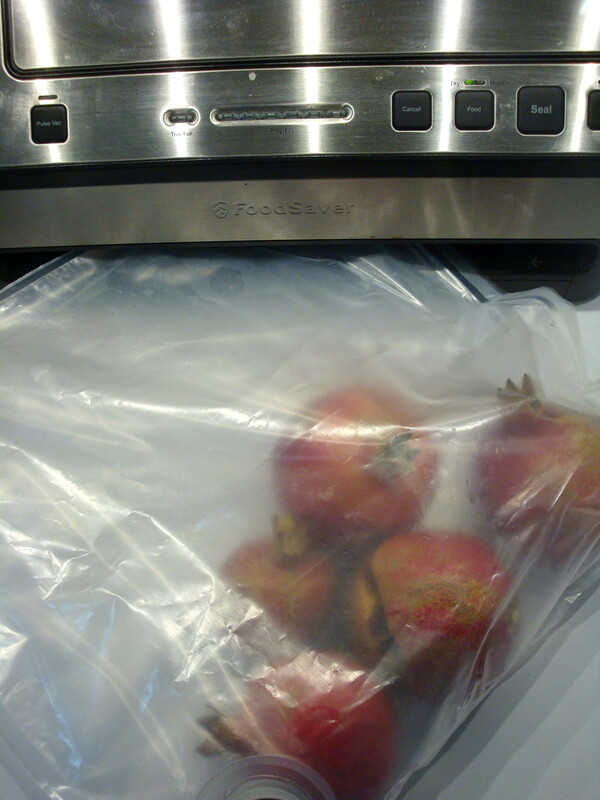 After cutting off the edge of the bag, just large enough to put about 5 pomegranates inside, I now could get a tight seal on the open edge, using my Foodsaver machine. Almost like new. 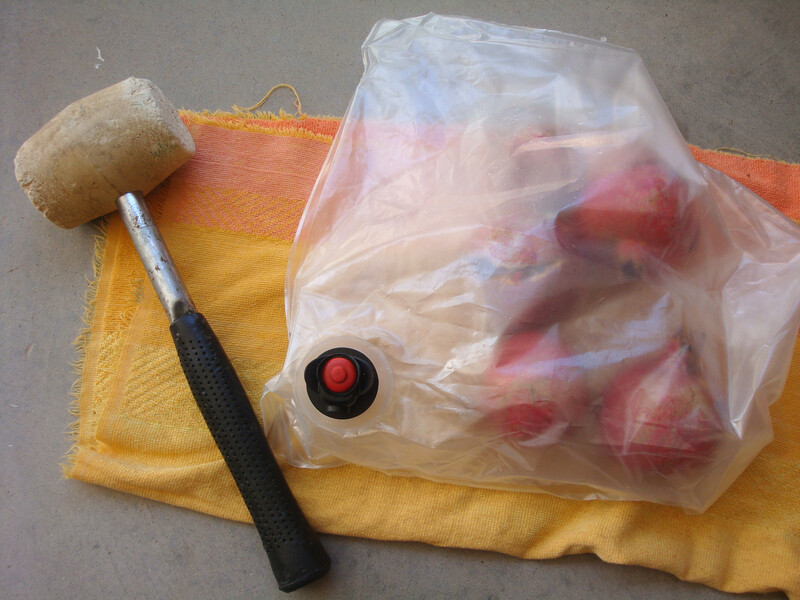 After taking the bag outside and wrapping it in an old towel, I took my trusty heavy-duty rubber mallet and began pounding away. 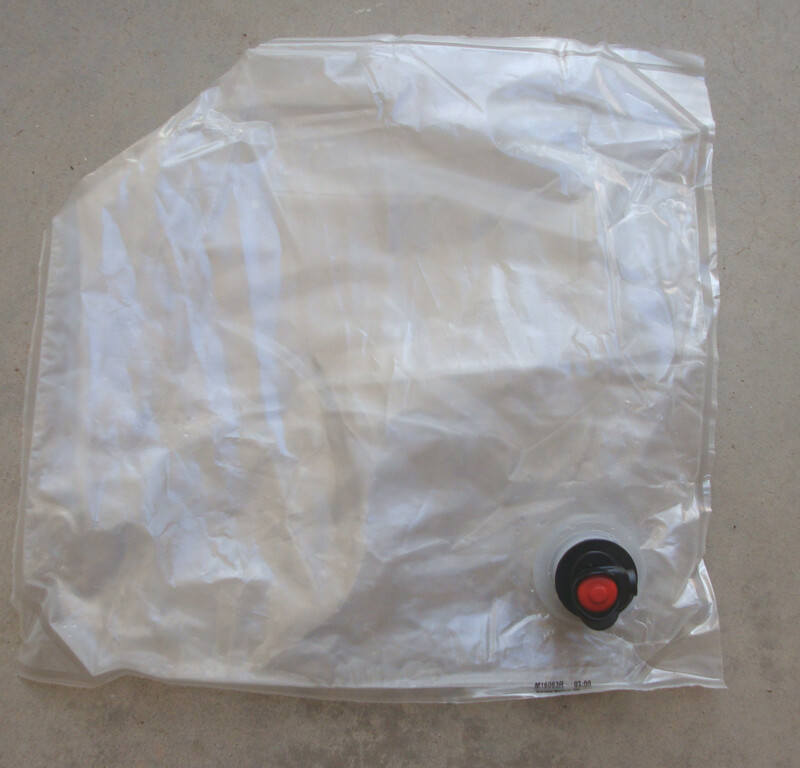 Place the bag on an old towel to absorb the blows and prevent the bag from becoming damaged. Pound away! After pummeling for a few minutes, the juicy arils had given up as much as they were going to. The contents of the bag after a few minutes of pummeling, ready to be drained. I clamped the bag to a piece of pegboard inside the garage and opened the spout, which is very easy to use. A good, steady flow of juice emerged. Afterwards, it is a good idea to have a helper squeeze out any remaining juice, while another pair of hands holds the valve open. 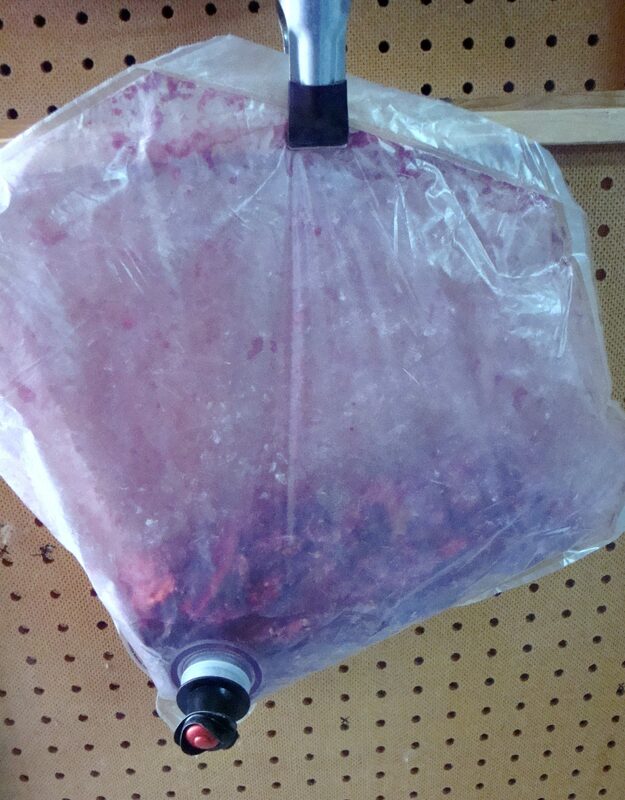 I clamped the bag on the edge of a pegboard, positioned over a plastic container to catch the juice. 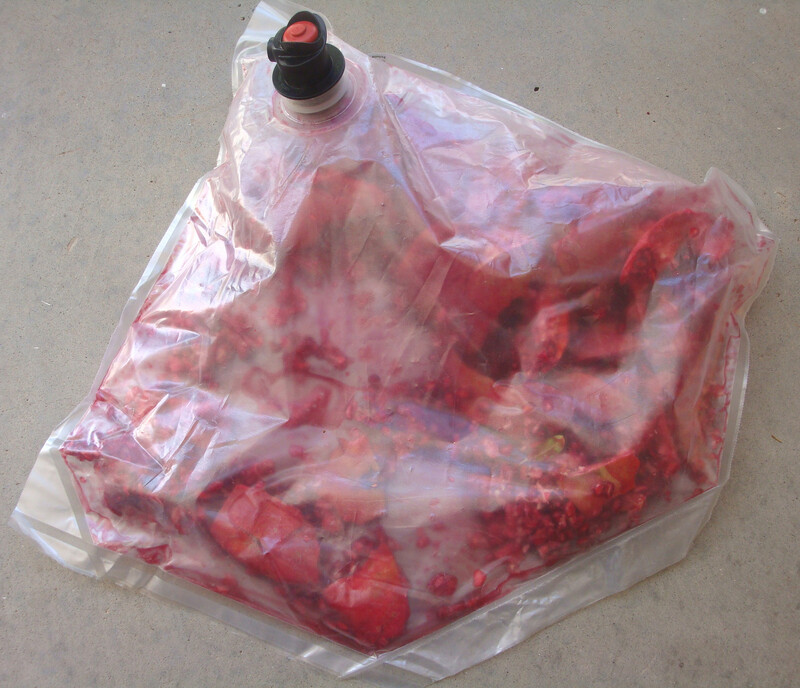 Opening the valve in the wine bag to let the juice flow out. I was able to rinse out the pulp from the bag and reuse it after a little more trimming. Not counting about 10 ounces I reckon was wasted when my foot inadvertently kicked over the plastic container I had started to fill, I had about 50 ounces of juice and there are still about half a dozen fairly large pomegranates waiting for me to drain the contents of the next wine box! Next was to find a recipe for Pomegranate Margaritas, which I did (several, in fact). 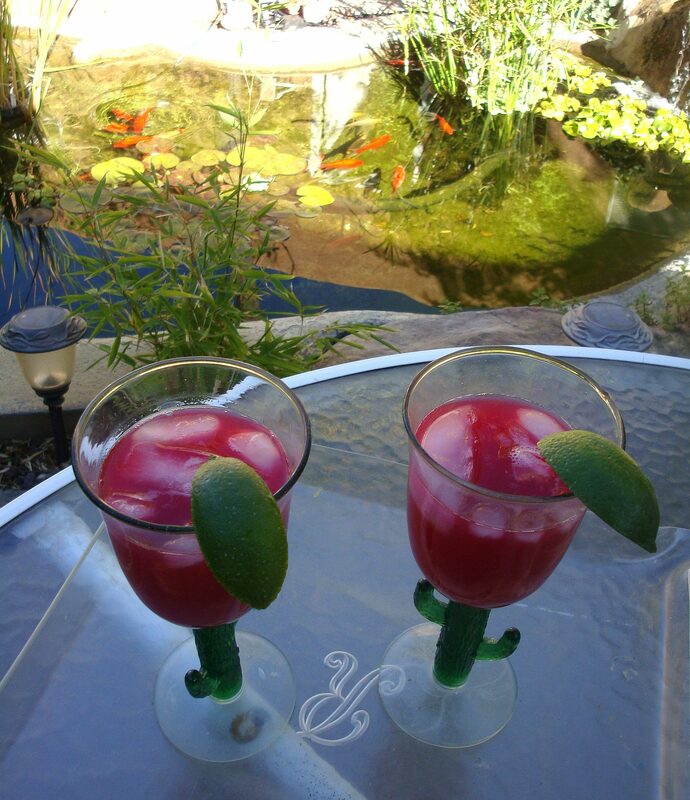 After a long (not really), hard (barely) day of pummeling pomegranate pulp, my husband and I were rewarded with the jewel-like glimmering of fresh Pomegranate Margaritas in the late afternoon sun in our courtyard, overlooking our goldfish pond. Life just doesn’t get any better! What could be better than fresh Pomegranate Margaritas on a late autumn day? This entry was posted in Cookbooks, Cooking, Cooking Technology, Desert Fruits, Guinness World Records, New Mexico, Recipes, Uncategorized, Vintage Cookbooks and tagged Albuquerque, Chile, cookbooks, Cooking, Guinness World Record, Kitchen Appliances, New Mexico, Southwest, Sue Jimenez, Vintage Cookbooks. Bookmark the permalink.